Scottish shepherds and their border collies are woven into the legend of New Zealand’s high country sheep stations. None made more impact than one young man who exchanged the damp Wester Ross highlands for the rocky tussocklands of Central Otago. James Elliott arrived in Dunedin in 1862, worked first as a simple shepherd and later found himself managing huge sheep runs in the upper Manuherikia Valley before farming in his own right in the Strath Taieri. 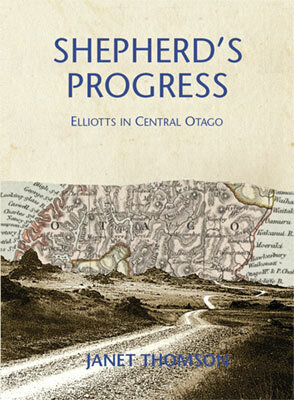 Shepherd’s Progress tells of James and Margaret Elliott and their family, in the last days of the great Otago sheep runs. It also tells the story of this shepherd’s enduring relationship with the firm of Ross and Glendining, one of New Zealand’s great Victorian and Edwardian mercantile partnerships. When Ross and Glendining decided to grow their own wool for the woollen mill and clothesmaking business, they asked James Elliott to help choose and then manage, their collection of sheep runs. The book includes chapters on the family background in Scotland, leading up to the decision to emigrate. • Profusely illustrated with 150 separate photos, period advertisements, drawings etc. • Table of contents: click here to see the table of contents and more pictures. Born in Dunedin, Janet Thomson spent family holidays in Central Otago, later teaching in Macraes Flat and discovering her great-grandparents’ connections with the area. After returning to New Zealand from teaching in the Solomon Islands with VSA, she made a career move into social work where she has worked since, most recently in London. After completing a master’s degree she followed her interest in genealogy and social history to research this part of her family’s place in the annals of Otago’s early history. The tartan on these pages is the Elliott family tartan.